Fayetteville, North Carolina, is a pioneer town in many respects. Settled by Europeans early in American history, Fayetteville became an early bastion of protest against Great Britain during the American Revolution and the site where North Carolina ratified the United States Constitution. The city was also home to an early Jewish settlement, though it did not develop an organized Jewish community until much later. The first Europeans to appear in the area were Scots from the highlands of their native country. Following the Yamasee and Tuscarora Wars in the early 18th century, Fayetteville became a commercial center of the British colonies. Located along the Cape Fear River, this inland port was divided into two towns originally named Campbellton and Cross Creek. Following the American Revolution, Fayetteville rose to prominence as a hub of business and government. In 1783, Campbellton and Cross Creek merged and officially became Fayetteville, the first town in the US to be named after the famed French Revolutionary general, Marquis de Lafayette. As an inland port, the town grew in wealth and size, being the second largest city in North Carolina by 1820 with 3,500 residents. It also became a major destination due to its centrality in the plank roads system that was crucial to transportation in the antebellum South. Though suffering a devastating fire in 1831, the city emerged and was rebuilt, including a new Market House that became a major locale of commerce. Jews have been an active part of Fayetteville throughout its history, and a Jewish community remains today. ​An article in the Fayetteville Observer states that “the history of the Jewish people of Fayetteville and Cumberland County finds its beginnings very nearly coincident with the founding of the county itself.” Jewish tombstones lie within a Jewish cemetery dating back to 1812. Famed Jewish Confederate leader Judah P. Benjamin, who later served as Secretary of State and War in the cabinet of Jefferson Davis, lived in the city between 1815 and 1822. But aside from these few vestiges of Jewish life, no evidence suggests a real Jewish community emerged in antebellum Fayetteville. Throughout the 19th century, Jews lived in Fayetteville but their numbers remained modest. The city was severely damaged by General Sherman during the Civil War but rebounded and grew tremendously afterward. Reconstruction and the New South era brought new industry and institutions to Fayetteville, including pioneering centers of African American education. In 1867, the Howard School was established, which later became Fayetteville State University. Still, by 1878, there were only 52 Jews recorded in the town. Over the next few decades, Jews would play a pivotal role in the city’s economic development. The first skyscraper in Fayetteville was a department store owned by the Russian-born Stein brothers. It was opened in 1916, four years after Kalman Stein and his brother Jacob formed The Capitol Department Store. Kalman Stein ran the business until 1940 when his son J. Bernard Stein, took over. J. Bernard Stein became a prominent business and philanthropic leader in Fayetteville. In 1909, Hyman Fleishman established B. Fleishman and Brothers department store on Market Street. Like the Steins, the Fleishman enterprise became a mainstay in the business world of Fayetteville. 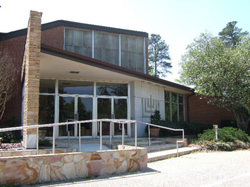 In 1910, the Jewish families of Fayetteville formed Congregation Beth Israel. Previously, Jewish families had met informally in homes for religious services. They now met in the McKeithan Building on Market Square with the guidance of a lay leader. Over the next decade, the members of the congregation became increasingly determined to build a permanent house of worship. 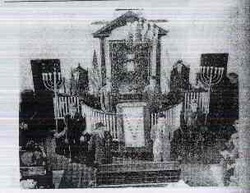 In 1917, the membership was incorporated and set about raising funds for the construction of a synagogue. The congregation moved to the Stein-Bridge building and the fundraising committee, led by Morris Goldberg, eventually collected $18,000. The Ladies Aid Society played a central role in the fundraising effort. Fannie Stein, Kalman Stein’s wife, was the founder and longtime president of the Ladies Aid Society, which was affiliated with Hadassah. Also crucial were the efforts of local businessmen Jacob Stein and Hyman Fleishman, who would become the temple’s first president. On May 22, 1922, Beth Israel’s synagogue on Cool Spring Street was completed. From its beginning, Beth Israel was an Orthodox congregation. The synagogue was built within walking distance of the congregant’s homes and included a mikvah (Jewish ritual bath). The congregation hired a series of shochets (kosher butchers), who also usually led services as best they could. Beth Israel also did not have an ordained rabbi until 1943 when the congregation hired Rabbi Charles J. Shoulson, a graduate of an Orthodox seminary. According to a contemporary history of the community, after Rabbi Shoulson’s arrival, services and the Hebrew School were “reorganized along more modern lines.” He also set up an adult bible study class. As the hometown of Fort Bragg, Fayetteville was transformed during World War II. Soldiers poured into the city, and as they came, the Jewish community offered its services. An Army and Navy Committee was formed, led by Harry Stein, which acted as a liaison to the stationed troops. Rabbi Shoulson offered religious services for the Jewish soldiers stationed in Fayetteville. On Passover, a large tent was set up for the Jewish soldiers to celebrate with the local Jewish community. World War II also led to immense population growth in the city. Post-war growth brought an influx of Jews, as the community grew from 175 in 1948 to 480 in 1960. Beth Israel responded with expanding its presence in the city, building a community center on Morganton Road in 1950 with a large social hall and a kosher kitchen. As more and more members moved to the area around the Beth Israel Center, the congregation decided to move its worship services from their downtown synagogue to the center. They built a new sanctuary and chapel in the Beth Israel Center, which became the home of the congregation. The congregation would periodically need to find new classrooms for its burgeoning number of students. By the 1980s, there were 500 Jews in Fayetteville. This growth began to affect the nature of the congregation’s religious service. In 1972, Beth Israel officially became a Conservative congregation and rewrote its laws to give women more rights in religious participation. In the 1990s, women were called for aliyah and were counted for a minyan, and in 2014 the congregation hired their first female rabbi. Fayetteville still has an active Jewish community today. Though many small towns throughout the South have experienced severe demographic dissipation, Beth Israel continues to offer religious services, a Sunday school for Jewish youth in Fayetteville, and a kosher kitchen. Beth Israel is still the only synagogue in Fayetteville, but with 186 adult members, it is a testament to the rich Jewish experience in Fayetteville and the South.